Occupancy sensors have two tasks: 1) Keeping the lights ON while the room is occupied, and 2) Saving energy by keeping the lights OFF while the room is unoccupied. 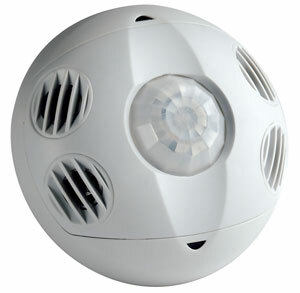 Passive Infrared (PIR) is an excellent and precise technology for initially turning the lights ON, but lacks sensitivity for minor motion at distances. Ultrasonic (U/S) technology provides maximum sensitivity with continuous reflective high frequency waves. This is optimal for keeping the lights ON. 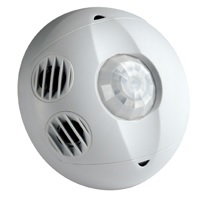 Leviton’s OSW12 sensor combines the benefits of both PIR and U/S technologies for unrivaled performance and reliability. • Wide Coverage: Over 1200 sq. ft of coverage. 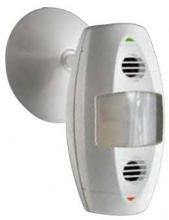 • Fast, Simple Installation: A single mounting post and three color coded wires make installation easy. • Self-Adjusting: Internal microprocessor continually analyzes, evaluates and adjusts sensitivity and time delay settings. Performance is kept at a maximum and user complaints are eliminated. • Non-Volatile Memory: Learned and adjusted settings saved in protected memory are not lost during power outages. • Timer Setting Feature: Automatic – 30sec – 30min. Test mode – 6sec with auto exit programming. • Ambient Light Recognition: A Light Sensor prevents lights from turning on when the room is adequately lit by natural light.